The new Seven Segment Display Module for Netduino Go from Komodex Labs is now shipping! This module features four 7-segment LED digits and can be used to display many types of data including sensor readouts, times, temperatures, and much more. The drivers for this module can be downloaded from the Komodex Labs Downloads page. If you want to check out some demos, open the Visual Studio solution file included with the source code and press F5 to deploy the sample application to your Netduino Go. You can press the button on the Netduino Go mainboard to cycle between the different display demos. To use the display in your own projects, first add a reference to the Komodex.NETMF.SevenSegmentDisplay.dll assembly within your project. If you have the Komodex Module Drivers package installed, you can simply right click on “References” within your project and select “Add Reference…” to find this assembly. The SevenSegmentDisplay class has several methods for controlling the behavior of the display. The SetValue method is used to set the actual value that appears on the module. SetValue has several overrides for use with different data types. You can use four different ints to set the value on each digit manually. Positive and negative floating point numbers can be displayed with a specified number of decimal places. 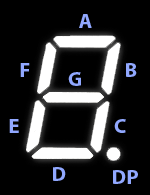 It is possible to send raw values (i.e., specific LED states) for each digit to the display. The Digit enumeration contains several common values including the numbers 0-9 and hexadecimal numbers A-F. It is also possible to cast a number to a Digit to specify custom digits. A custom digit is simply an 8-bit integer. The 7 least significant bits are used for the digit, and the 8th bit is used for the decimal point. The diagram to the left shows the position of each segment. The binary value 01101101 is represented in hex as 0x6D. You can cast this or any custom value to a Digit to display it on the module: (Digit)0x6D. Strings can also be interpreted and displayed. The string parser understands digits 0-9, hex digits A-F, dashes, decimal points, and spaces. When a decimal point is found, it is appended to the previous digit. The colon and apostrophe are controlled independently from the rest of the display. They can be turned on or off at any time without changing the displayed value. The DateTime parser will, by default, show times in 12-hour mode, using the last decimal point as a PM indicator. The TimeSpan parser will automatically choose between displaying hours and minutes or minutes and seconds. If the TimeSpan is less than one hour long, the value will be displayed in mm:ss format. Otherwise, it will be displayed in hh:mm format. The brightness of the entire display (including the colon, apostrophe, and decimal points) can be modified by sending a floating point value between 0 and 1. Desktop and mobile application developer, hardware hacker.